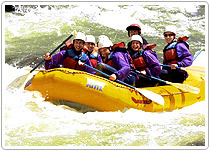 On the North of Kashmir valley is Great Himalyan Range and on the south is Pir Panjal range and both the Himalayan Mountain ranges are source of many rivers and offer world class opportunity for White water river rafting. 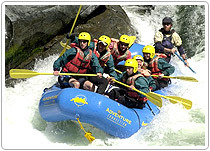 Chandanwari to Nunwan starch of river Lidder offer many exciting rapids for River Rafting. 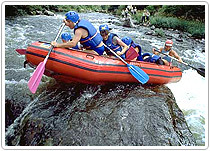 Other river popular for river rafting are Chenab, Jhelum, Suru river, Drass river, Indus and Zanskar river in Ladakh. Day 03 : Drive Leh – Kargil (3201m ; 10500 ft ; 9-10 hrs). We drive from Leh to Mulbek - Kargil, through a spectacular moonscape. We drive over the Fotu La (14,000 ft), a high mountain pass and exit the Indus valley. Enroute, we do a photo stop above the Lamayuru monastery belonging to the 'Red Hat' sect. Overnight Kargil hotel. Day 04 : Drive Kargil - Rangdum (12,000ft). A spectacular drive past Panikar and Parkachik,with magnificent views of the Nun and Kun massifs (7000 metres),hanging glaciers and large meadows.We drive till Rangdum Gompa (12,000 ft).Camp overnight. Day 08 : After packing camp, we raft 25 km to Nyerak (3286m ; 10,780ft ; 3 hrs) a Class III section. The gorge narrows in on the river - this indeed is a Grand Canyon in its own right. We stop for the day to pitch camp in a gorge below Nyerak village. Day 12 : Transfer to Leh airport. Fly Leh - Delhi.